Potential residents exploring real estate options in and around Atlanta are impressed by the Buckhead area. It offers luxurious mansion homes, fine dining restaurants and designer shopping. Buckhead is one of the most affluent communities in the nation and residents enjoy sprawling properties with well-manicured lawns in quiet gated communities. Tips for renting an apartment or buying a home in Buckhead Atlanta, GA. The median age for Buckhead residents is 38, which is slightly older than the Atlanta median age of 33. Most residents are Caucasian and hold bachelor’s degrees or graduate degrees. The median annual income for Buckhead residents is $83,242 and most are in full-time managerial, executive or business professional positions. About half of the residents in Buckhead own their homes and affluent neighborhoods usually have homes for sale listed at over $400k. 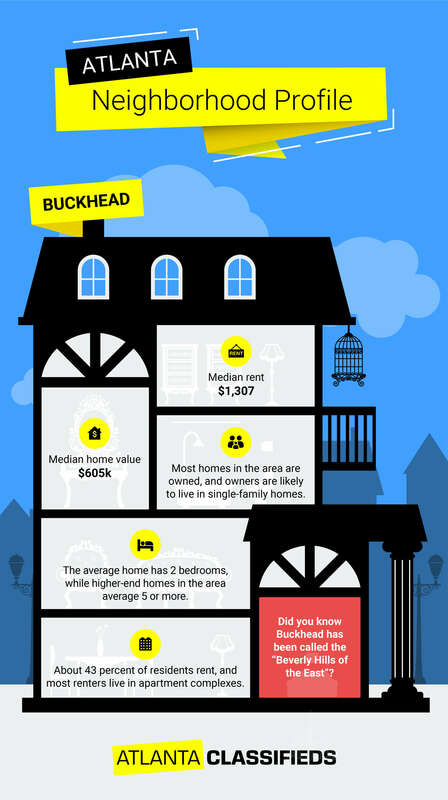 The average median sales price for houses in Buckhead is $491,544. Residents who do not want to invest in single family homes can purchase condos in luxurious buildings for under $300k. Some Buckhead residents rent apartments or other properties in the area to avoid the high listing prices. The average rent for a property in Buckhead is $1,786 per month. Rent varies depending on the size, type and location of the rental. A one bedroom apartment in North Buckhead averages around $1,580 per month while the same apartment in Tuxedo Park costs about $1,550 per month. Buckhead may seem like the suburbs with its many gated communities, but the area also boasts 1,400 retail units. This makes it a popular destination for locals and tourists who want to shop in luxurious and contemporary boutiques. The Shops at Buckhead on Peachtree Road is an eight-block shopping complex with high-end designer retail shopping, including Tom Ford and Cynthia Rowley, and several dining options, such as Bella Cucina and Doraku Sushi. Andrews Square in West Buckhead Village offers local sophisticated boutiques and diverse shops. Additional shopping malls with unique boutiques and lux name brands include Phipps Plaza and Lenox Square. These properties are located in the Buckhead Hotel District, an area with several elegant hotels that are popular for dining, shopping and nightlife activity. The Hotel District includes numerous high-end hotels, such as the St. Regis, Ritz Carlton and Mandarin Oriental. Dining options include Atlas in the St. Regis hotel, which is a local favorite for its seasonal food and beautiful rotating art. The Café is in the Ritz Carlton and offers an impressive weekend brunch and beautifully crafted dinners. Homes in Buckhead are located in neighborhoods that are often far from local shops and restaurants. This makes the area not very walkable for visitors or residents. However, residents can use the Metropolitan Atlanta Rapid Transit Authority (MARTA), a bus and train line, for public transportation to other neighborhoods in the city. Only one MARTA train station is located in the community. Buckhead Station is positioned on Peachtree Road and runs the red line. Most Buckhead residents use their own cars or ride-share programs to travel to different establishments in the area. However, there are extensive bus lines that run throughout Buckhead for residents who opt to utilize public transportation. In addition to shopping, Buckhead residents can explore the Atlanta History Center, which offers exhibitions, gardens, activities and historic houses that tell the story of the city and its roots. Legoland Discovery Center is also located in Buckhead at Phipps Plaza and offers several fun exhibits and activities for children. Within the perimeter of Buckhead there is an active nightlife scene. Residents who feel the clubs and lounges in the Buckhead Hotel District are too swanky still have an eclectic mix of bars to choose from. The Red Door Tavern is a fun local bar with a large outdoor deck. Big Sky Buckhead is a rooftop lounge with clever cocktails and views of the skyline. Buckhead offers a mix of public and private schools, similar to other suburban neighborhoods in Georgia state. While the public schools in the area have high rankings, many parents opt to send children to local private schools, such as Lovett School or the Westminster School. Less than half the number of crimes occurred in Buckhead as did in Atlanta. Many potential real estate purchasers are interested in Buckhead due to its low crime rate and high safety ratings when compared to other Atlanta neighborhoods. Most of the crimes that occurred in the area were property crimes and violent crimes were scarce.